Eidos Montreal and Square Enix have uploaded a video today featuring ten minutes of footage compiled from the upcoming, rock climbing, throat-stabbing adventure game Shadow of the Tomb Raider. 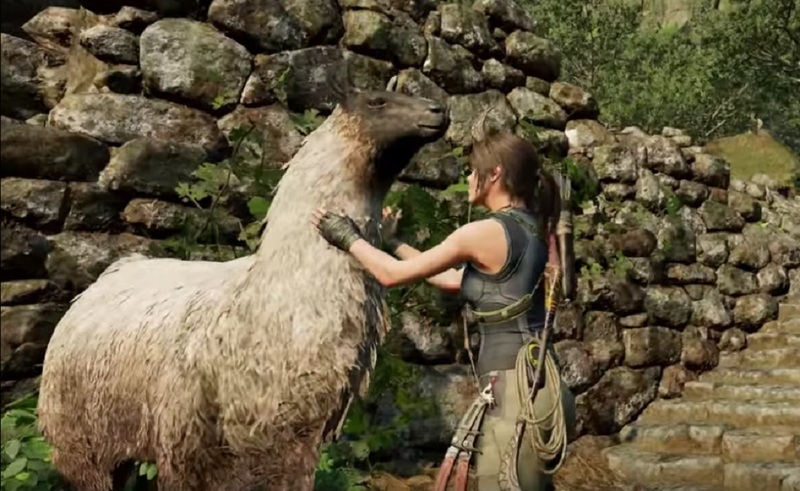 Complete with commentary by Narrative Director Jason Dovoiz, the clip introduces us to the hub of Paititi, a hideaway village where famous treasure hunter Lara Croft can rest, trade goods, accept side-quests, lay low from gun-toting psychos, or just hang out with the alpacas. We also get to see Shadow's in-game bartering system, where Lara can bargain with the locals for useful supplies. The video then goes on to show us a little of one of the new game's Challenge Tombs, with Ms. Croft traversing the deadly terrain that is fast becoming her natural environment, using her acrobatic abilities and steely reserve to once again set foot where most wouldn't dare to tread. Shadow of the Tomb Raider launches on PS4, Xbox One and PC on September 14.